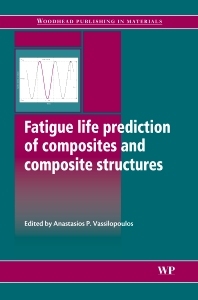 Introduction to the fatigue life prediction of composite materials and structures: Past, present and future. Part 1 Fatigue life modeling: Phenomenological fatigue analysis and life modeling; Residual strength fatigue theories for composite materials; Fatigue damage modeling of composite materials with the phenomenological residual stiffness approach; Novel computation methods for fatigue life modeling of composite materials. Part 2 Fatigue life prediction: Fatigue life prediction of composite materials under constant amplitude loading; Probabilistic fatigue life prediction of composite materials; Fatigue life prediction of composite materials based on progressive damage modeling; Fatigue life prediction of composite materials under realistic loading conditions (variable amplitude loading); Fatigue of fiber reinforced composites under multiaxial loading; A progressive damage mechanics algorithm for life prediction of composite materials under cyclic complex stress. Part 3 Applications: Fatigue life prediction of bonded joints in composite structures; Health monitoring of composite structures based on acoustic emission measurements; Fatigue life prediction of wind turbine rotor blades manufactured from composites.